Cosben Equipments is committed to providing quality products & best services to it’s customers. We as a team have always been emphasizing on Safety Measures & the Technical Know How of our products to our customers. We have been conducting Technical/ Engineering seminars to make our customers (especially the equipment operators) aware of the simple, yet important points to ensure the longevity of our equipment. Through this blog, we wish to share with all our patrons the Safety Measures & Precautions (Do’s & Don’ts) for the Screw Feeder/ Conveyor (referred to as Screw) Installation & Maintenance. We request all our customers to insist on a copy of the Cosben Equipment’s Manual for Screw. Our manual provides all the instructions, guidelines & warnings to the user of our equipment. While assembling, remove the protective packing from the drive unit. If the screw is in different sections, then the flight/ spiral restriction bracket needs to be removed. User (Team responsible for installation/ erection & commissioning) needs to assemble the various sections of the Screw together, ensuring that all the sections have the same serial numbers and check at the same time the numeric order of the sections. Ensure to insert paper gaskets between the connecting sections. Make sure to check whether any foreign body or water has entered the screw’s tube/ pipe/ housing. If so, remove the inspection hatch covers & clean it before installation. Once assembled it is strictly advised to lift the screw using ONLY the lifting eyes mounted to the screw pipe/ casing. During each phase of installations, kindly ensure that all the sections and the screw feeder is handled/lifted by a crane of appropriate capacity. It must be checked that all the steps & operations of installation have been completed. The electrical connections with the Mains must be carried out by an Electrician or other qualified personnel Only. It is mandatory that the person making the connections checks the sticker/name plate on the motor body to confirm whether it is a Star Connection or a Delta connection. No foreign body has entered during assembly & installation. If that’s the case, please remove it. Ensure the intermediate & end bearings are greased and the oil in the gearbox is at correct level. Need to check that all the inspection hatches are closed & sealed. (Cosben Equipments’ additional safety component – Isolation Lock Switch) ensures that such occurrences are prevented. User also needs to ensure that the direction of the rotation of the screw corresponds to the direction of the arrow as indicated on the identification plate. If the direction of rotation is wrong, it is important to reconnect inverting the polarity of the motor. Run the Screw Feeder/ Conveyor (in empty condition) for maximum 2-3 minutes & in case of abnormalities, please stop the equipment. Once everything has been checked & confirmed as OK, start up the Screw again with no material and gradually begin to introduce the material until reaching the normal operating capacity. Please make sure that the Mains (Power Connections) have been switched off before carrying out any maintenance or service related tasks. All checks, inspections & maintenance shall only be done by skilled & authorized personnel Only. At the end of every working day, the operators needs to ensure that they run the Screw Feeder/ Conveyor until it is empty. This operation prolongs the life of the screw. It is recommended to grease certain hanger bearings after every 40 hours of operation. Never use Oil for Lubrication! It is important that the intermediate hanger bearings are regularly inspected and routinely replaced every 2 years. DON’T run the Screw Feeder/ Conveyor in reverse direction. 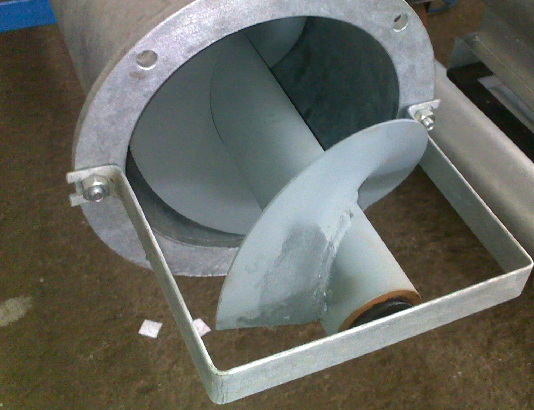 DON’T install the Screw Feeder at an angle higher than the recommendations of our team. This will affect the output rate. For any other information on our DO’s & DON’Ts or installation and maintenance instructions, please get in touch with us on Cosben Contact or email us on info@cosben.in. Previous Previous post: Cosben Equipments introduces additional components with it’s Screw Conveyor for Assured Safety!